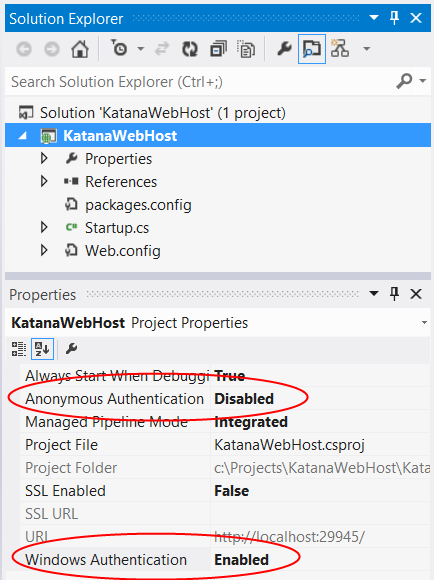 This article shows how to enable Windows Authentication in Katana. It covers two scenarios: Using IIS to host Katana, and using HttpListener to self-host Katana in a custom process. Thanks to Barry Dorrans, David Matson, and Chris Ross for reviewing this article. Host: Manages the process in which the OWIN pipeline runs. Server: Opens a network socket and listens for requests. Middleware: Processes the HTTP request and response. Microsoft.Owin.Host.SystemWeb. Uses IIS with the ASP.NET pipeline. Microsoft.Owin.Host.HttpListener. Uses System.Net.HttpListener. This server is currently the default option when self-hosting Katana. Katana does not currently provide OWIN middleware for Windows Authentication, because this functionality is already available in the servers. Using Microsoft.Owin.Host.SystemWeb, you can simply enable Windows Authentication in IIS. 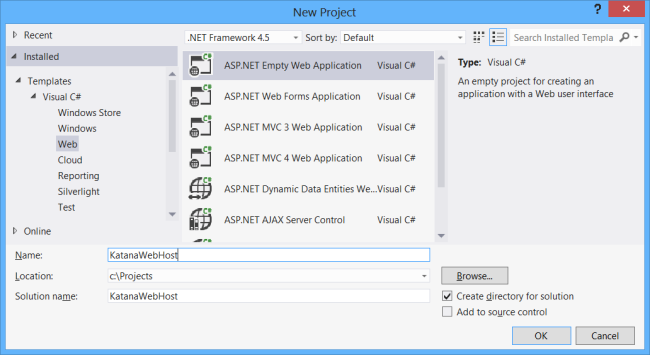 Let's start by creating a new ASP.NET application, using the "ASP.NET Empty Web Application" project template. That's all you need to create a "Hello world" application for OWIN, running on IIS. Press F5 to debug the application. You should see "Hello World!" in the browser window. Next, we'll enable Windows Authentication in IIS Express. From the View menu, select Properties. Click on the project name in Solution Explorer to view the project properties. In the Properties window, set Anonymous Authentication to Disabled and set Windows Authentication to Enabled. The WWW-Authenticate headers in this response indicate that the server supports the Negotiate protocol, which uses either Kerberos or NTLM. Later, when you deploy the application to a server, follow these steps to enable Windows Authentication in IIS on that server. If you are using Microsoft.Owin.Host.HttpListener to self-host Katana, you can enable Windows Authentication directly on the HttpListener instance. This class implements the same "Hello world" example from before, but it also sets Windows Authentication as the authentication scheme.